The use of drones to find and kill militant targets in other countries has increased exponentially under the Obama administration. But the accidental deaths of civilians is increasingly turning a once-receptive public against the combat tool. GlobalPost launches a series of reports Monday about the controversy surrounding the use of U.S. drones. Peter Gelling, deputy editor of GlobalPost, said the concept came about after one of their reporters, Aamir Latif, traveled in May to North Waziristan — a mountainous region abutting Afghanistan where many militants seek shelter. He found a major uptick in the use of drones to target the militants, with little acknowledgement in the American media. That has since changed with more strikes coming to light, including the recent killing in Yemen of high-ranking al-Qaida member Anwar al-Awlaki. The use of drones against the cleric, who was born in the United States, also raised legal issues about the targeted killing of a U.S. citizen. Latif discovered in his reporting that local Pakistanis, who were initially not taking sides in the fight against the militants, were growing increasingly angry over the use of drones because of the accidental civilian deaths. The London-based Bureau of Investigative Journalism has reported on the growing number of civilians killed in the strikes. And protests in Pakistan, Somalia and Yemen have become commonplace, GlobalPost reports in its series. The Obama administration has two drone programs: one in declared war zones such as Iraq, Afghanistan and Libya, and in undeclared war zones including Somalia and Yemen; and another program, directed by the CIA and not publicly acknowledged, operating mostly in Pakistan. “Although the first strike by an armed drone took place in Pakistan in 2004 under then-president George W. Bush, it’s Obama who fully embraced the technology. 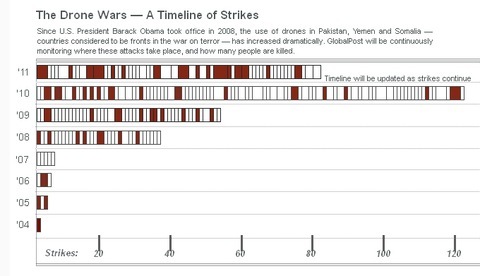 Under Obama’s watch, in fact, the number of drone strikes has increased exponentially,” from 13 during years 2004-2007, to 122 in 2010, Gelling reports in his overview piece for the series. 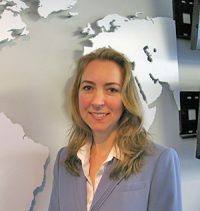 More GlobalPost stories look into the legality of drone use, by Jean MacKenzie. Suzanna Koster in Islamabad reports on Pakistanis’ frustration with the CIA presence in their country but the Pakistani government’s tacit approval. Emily Lodish talks to the designers and developers of the unmanned aerial vehicles. Watch for more coverage on the NewsHour of the use of U.S. drones. View all of our World stories and follow us on Twitter.